Kitchen Island Pendant Lighting, On Wheels, Storage and More! 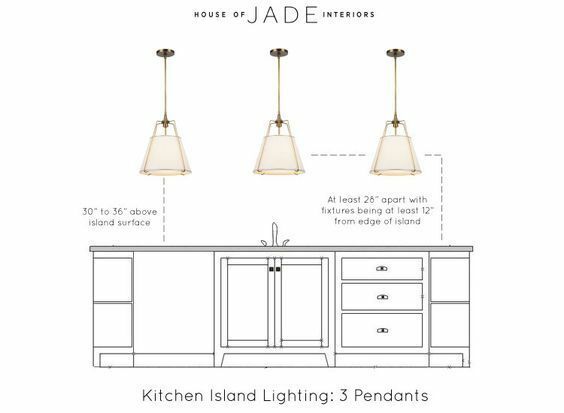 If you’re adding a kitchen island or want to spruce up your existing island, kitchen island pendant lighting, some wheels or shelving will give you additional task lighting, portability and storage to make your kitchen more functional. The beauty of a kitchen island is that you can get more shelving and worktop space without the high expense of a kitchen remodel. 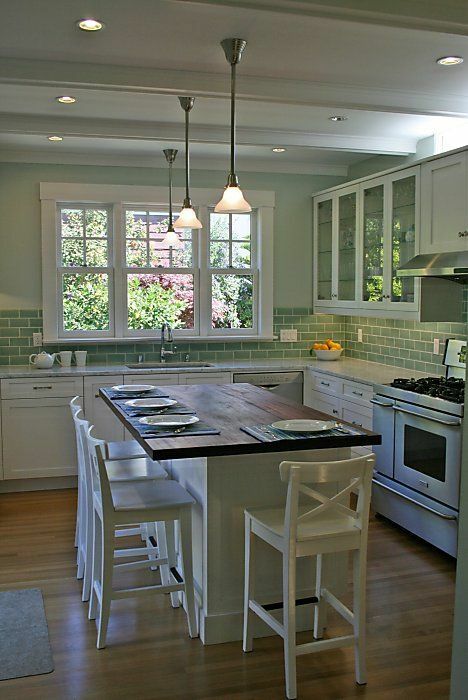 Deeper larger kitchen islands double up as breakfast or dining areas and give you more countertop prepping space. 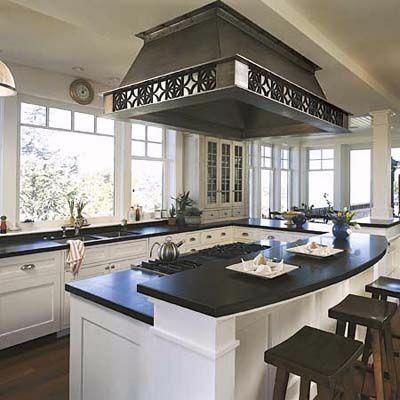 Here are five kitchen island ideas to help you find the best kitchen island design for your kitchen. 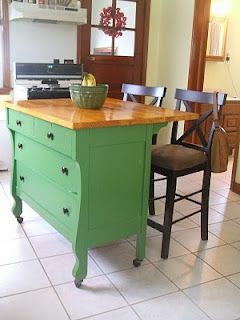 If space is an issue consider adding wheels to your island making it mobile. 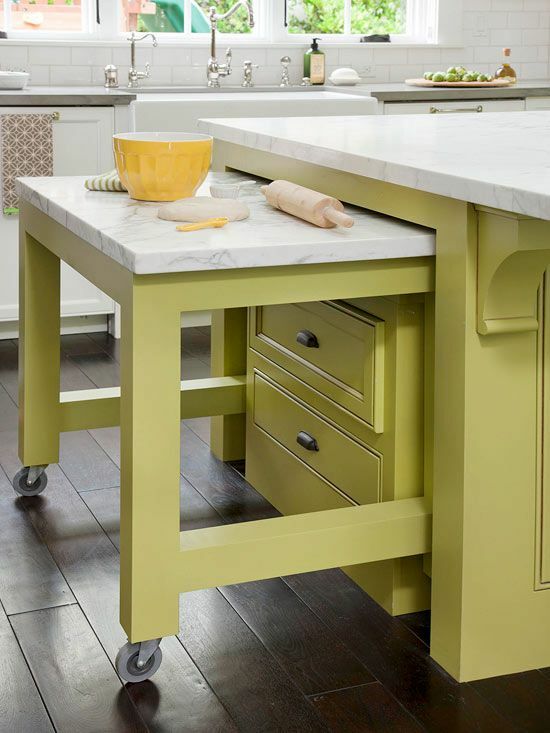 Your kitchen island, trolley or cart becomes a portable prep area that can go anywhere and quickly moved aside when you don't need it. Pros: If your kitchen doesn't have space for a fixed island, an island on wheels will give you the extra countertop space you need. You can use them for storage too. Cons: Your island should be on the smaller size. Preparing food on wheels isn’t always easy, even when the wheels are locked. Storing heavy items makes your island difficult to move and puts additional strain on the wheels. What about wheels for you bakers table? Perfect for times you need a little more space. 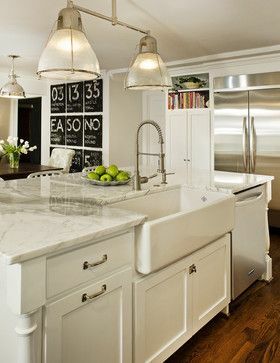 A kitchen island needs effective task lighting if you want to use it for prepping food. 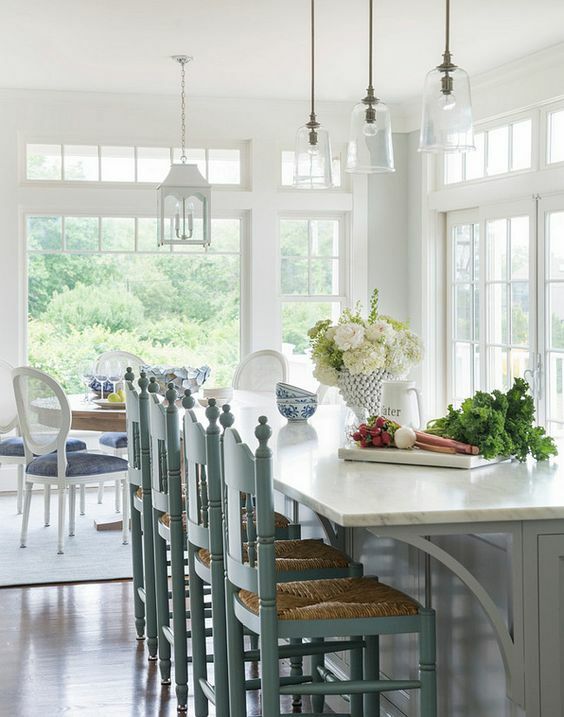 That's why kitchen island pendant lighting remains a strong trend. Instead of working in the dark or around shadows, pendant lights help you use your kitchen island to the fullest. Pros: Great kitchen lighting helps you get things done faster and reduces the likelihood of accidents. Cons: Adding kitchen pendant lighting can be expensive. Apart from the cost of pendant lights you need an electrician to install them and someone to repair and paint your ceiling once they are installed. 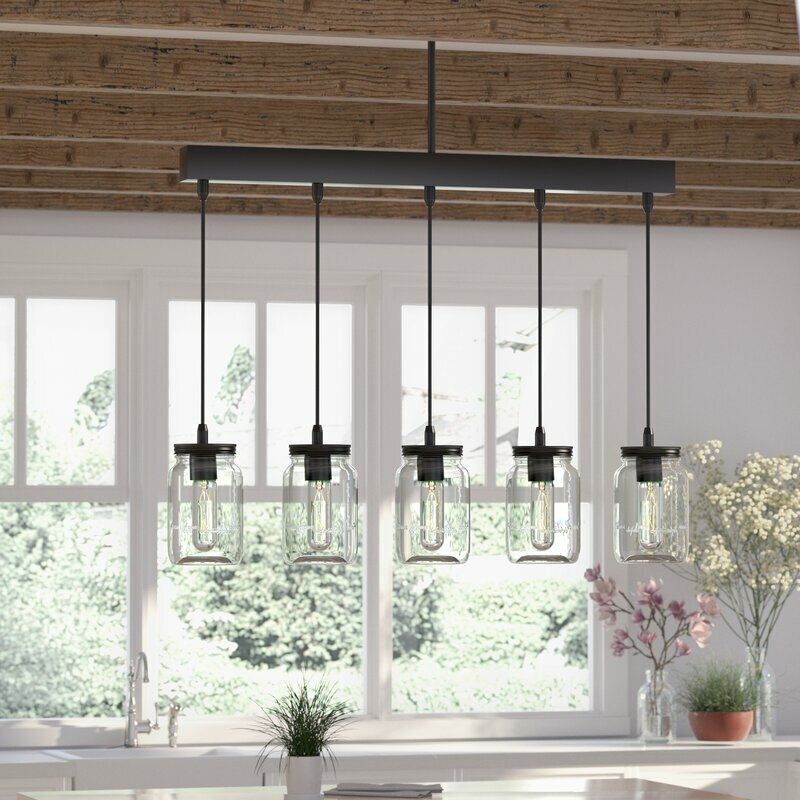 You can always choose one pendant with 3 lights or more. This will reduce costs. These kitchen islands are available in L, U or circular shapes. 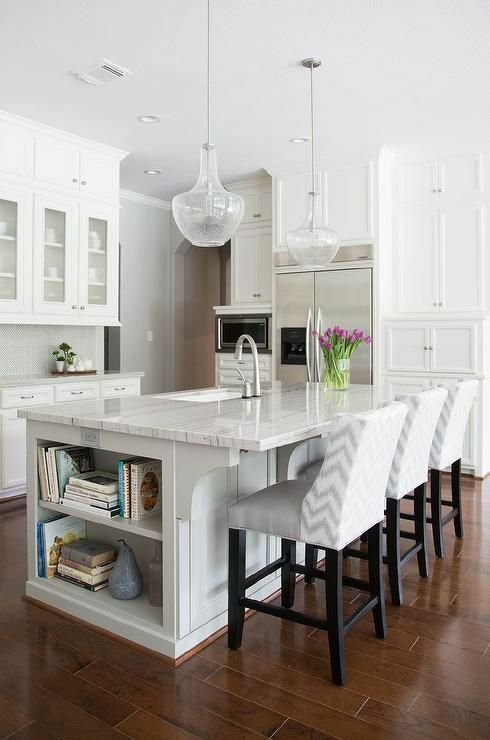 Shaped kitchen islands can work well with, or as an extension of your existing kitchen counter space to make your kitchen countertops look bigger. Pros: Shaped islands usually have the largest amount of storage space and offer great seating space. Cons: Shaped islands can take up a lot of kitchen floor space, making your kitchen footprint look smaller. The envy of most people, these islands have access to running water and electricity so you can do everything you would on regular countertops. They are a beautiful feature and add more functionality. Pros: Fully functional islands can act as a second kitchen prepping space. 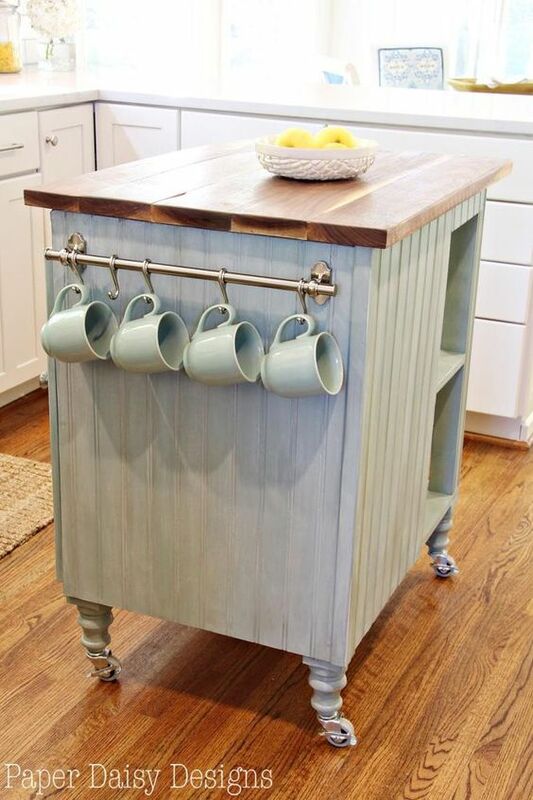 This is great if you run a busy kitchen, need to store a dishwasher or wine cooler and entertain a lot. Cons: Installing a sink and / or stove top can prevent it from being used as a breakfast bar and takes away storage space. They are expensive and if you don't really need it, you will have two kitchen sinks to clean. 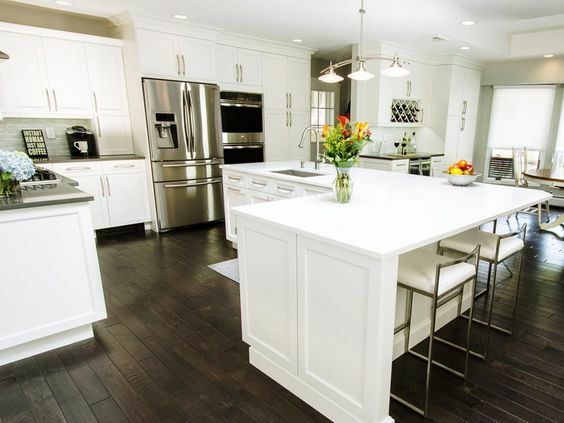 If you’re looking for an island solution that functions as both a food prep and eating area, consider an island with two countertop levels and is large enough for seating. Pros: These islands are great for open floor layouts. It creates a transition area and an additional eating zone. Cons: The available counterspace frequently is narrower in a two-tiered island. These kitchen islands include both cabinet space and shelves, giving you more options for storage. Here's a DIY conversion solution. Pros: Shelves let you show off your favorite knickknacks and kitchen décor, while cabinets let you hide away pots and appliances. Cons: These islands tend to have less cabinet space. Add more counterspace to your kitchen by choosing a kitchen island that meets your needs, your space, and your vision for your kitchen.